We were visiting my best friend Alicia (you may remember the post she wrote about camping in Utah) when she asked if we’d be interested in going to Dinosaur Ridge. Hell yeah!! I mean, who wouldn’t want to touch real fossils and see dinosaur footprints? The first Stegosaurus discovery in the world was at Dinosaur Ridge! The Visitor Center itself is small, but it includes the Discovery Center which has some really cool exhibits as well as a simulated dig site, snacks, and a gift shop. To see the really cool stuff, however, you gotta head back outside. Visitors have the option of taking a paid 45 minute shuttle tour or doing a free self guided tour. Because it was already late afternoon, we chose to do the self guided tour. If we’d had more time, we would’ve preferred to go with a guide because we always feel like you get more out of the experience. With that being said, there are over 15 detailed signs along the ridge, so we still felt like we knew exactly what we were looking at. After seeing fossils in museums and books, it was super cool to finally be able to see them right there in front of us and even touch them. The bone quarry has fossils that are most likely from stegosaurus and apatosaurus and it’s interesting to find out how they got there. Learning about the geology of the area was really fascinating as well. Can you imagine seeing the earth shifting? Moving and creating whole new landscapes? It’s amazing! And of course the coolest part is seeing the over 300 footprints left by various dinosaurs and one crocodile. According to their website, about half of the footprints are periodically colored with charcoal by volunteers to help make the footprints more visible to visitors. 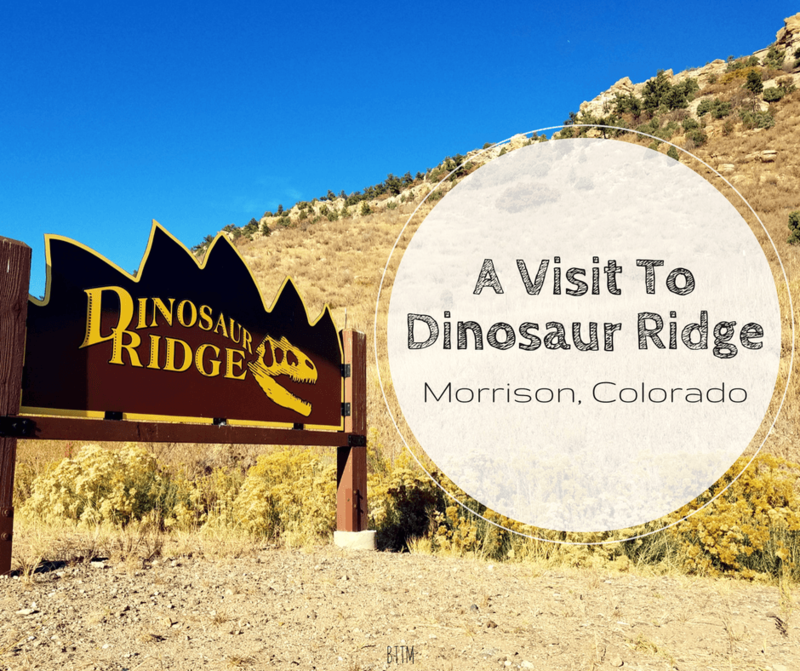 We spent about an hour and a half at Dinosaur Ridge between checking out the Visitor and Discovery Center and walking along the ridge but could easily have spent more time there had we arrived earlier. It was a really fun place and we’re so glad Alicia recommended it! If you’d like more information on Dinosaur Ridge hours (they vary by season) and pricing, we recommend visiting their website. Sounds like an amazing experience to visit Dinosaur Ridge. It would be great too if the future generation of this planet can have the same amazing experience. Thanks for sharing this! How cool is this! I lived in Denver many, many years ago and didn’t know this existed. I’m going back in a couple of months so I’ll be sure to plan a visit to Dinosaur Ridge. Thanks for the heads up. Sounds very cool. I have spent a lot of time banging around Arizona limestone. I usually spend my time a couple of epochs older than the K-T boundary. Still, geology is fascinating and geology and dinosaurs together…. That’s pretty darn cool. This looks like the perfect place to take your kids, nephews and nieces and even grandkids. Educational and fun! Who would have thought there would have been crocodiles in Colorado way back when? What a cool place to visit! I was always fascinated with dinosaurs growing up. Terrified, but fascinated. That’s crazy you were allowed to touch the fossils too – how do they make sure it remains preserved with all that physical contact? Oh this is nice! I haven’t heard of a place like this specifically about fossils and dinosaurs. I would love to go as well to learn more! It’s such an interesting place and you can really learn a lot about the animals and geography of the area. A place to be for fossil lovers. Real footprints…OMG. Really interesting place. Who doesn’t love dinosaurs! My kids would get a Kick out of this!!! they are always asking questions about if Dinosaurs are still alive as they cannot quite grasp the concept of millions of years ago! Last week was a lifetime ago to them! When we pass through we will check this out for sure! Awesome! I think they’ll love it Lindsay!